Morse is a leader in manufacturing taps and dies for professional craftsman. Tap and dies are cutting tools used to make threading possible. 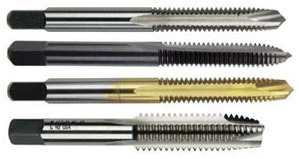 There are many styles and types of taps and dies each designed for a specific tapping or threading purpose. The selection below show a wide range of taps and dies and explains each purpose in regards to your application. We strive to offer the widest selection of centerdrills and spotting drills. If there are specific Morse Taps and Dies you are looking for, please call us at 1-887-477-8665 or click here to contact us online. Solid Carbide offers higher cutting speeds, high rigidity,excellent hardness, wear resistance and heat resistance and long tool life. ALTiN - Aluminum Titanium Nitride is an excellent all-around coating that is especially recommended for high thermal stress applications including dry machining, abrasive materials and difficult-to-machine materials. 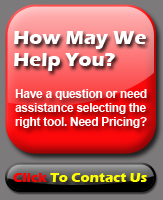 Benefits include higher cutting speeds and longer tool life. Application specific geometries engineered for high performance, high productivity tapping in a variety of materials. Morse Cutting Tools offers a complete selection of styles, sizes and "H" limits including metric sizes enabling you to choose the right tap to optimize your tapping application. Powder metallurgy high speed steel, unique geometry, surface finish and tool coating ensure consistent, predictable performance, at a lower cost per tapped hole. “ShearTap” offers exceptional value for high volumeproduction tapping in carbon steels, and stainless steels up to 35 Rc hardness. For general purpose tapping in a wide varietyof materials up to 28Rc hardness. High Speed Steel Straight Flute hand taps are used for hand tapping and machine tapping in through holes or blind holes in a wide variety of materials. Available in sets, taper (8-10 thread chamfer), plug (3-5 thread chamfer) or bottoming (1-2 thread chamfer). 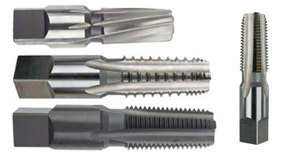 Spiral Point taps are designed for machine tapping in through holes in a wide variety of materials. The point ejects the chips ahead of the tap, eliminating chip disposal problems and thread damage. Shallower flutes also result in greater tap core strength allowing for higher cutting speeds. Steam Oxide Surface Treatment increases wear resistance, reduces friction, acts as a lubricant, reduces galling and chip welding. Improves chip flow and increases tap lubricant retention. Spiral Flute taps lift the chips out of the hole in blind hole tapping, eliminating chip disposal problems, damaged threads and broken taps. They will also bridge interruptions in the tapped hole. Slow Spiral taps have a stronger cutting edge (less susceptible to chipping) than Fast Spiral taps and are recommended for general purpose applications. Thread Forming taps cold form rather than cut the threads. Advantages include no chips to dispose of, stronger higher quality threads, increased tapping speeds, longer tap life and reduced tap breakage. Recommended for a wide variety of ductile materials. STI (Screw Thread Insert) taps are oversize taps that produce a thread that will accept a helical coil wire screw thread insert of the same size and pitch. NPT/ANPTNPTF Chamfer  2-3¹⁄₂ threads Regular Thread NPT taper pipe taps are commonly used for tapping pipe fittings and couplings in a wide variety of materials. Assembly requires the use of a thread sealant to ensure a tight seal.NPTF Dryseal taper pipe taps produce threads where a tight seal is achieved during assembly by metal-to-metal contact. Used for applications requiring a tight seal without the use of thread sealants. Interrupted Thread taper pipe taps reduce friction, increase chip capacity and enhance coolant flow to the cutting teeth for reduced chance of torn threads and improved thread quality. Recommended for a wide variety of materials, especially soft ductile materials and materials producing long continuous chips. Combined Tap and Drills drill and tap in a single pass for increased productivity. Recommended for through hole applications up to 2X the nominal diameter of the tap. The self-centering point eliminates the need for center drilling or center punching. NOTE: Drill point must penetrate the workpiece prior to start of tapping. High Speed Steel Adjustable Round Split dies use a set screw for adjustment of the thread size for precision threading applications. High Speed Steel dies recommended for longer tool life. Hexagon Rethreading dies are used in repair and maintenance applications to repair existing bruised or rusty threads. They are not recommended for cutting new threads. • 10 popular sized high speed steel hand taps. • 10 popular sized high speed steel screw machine length drills. • 128 Page Machinist’s Guide for Taps. • Packaged in a durable plastic pouch. Didn't find the Morse Taps and Dies you were looking for or need assistance in selecting a tap or die?